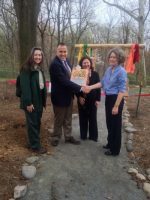 Smith Memorial Playground and Playhouse, located in East Fairmount Park, has been a treasured destination for over 100 years. 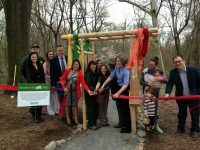 Smith strives to be Philadelphia’s foremost resource for play by providing opportunities for unstructured creative play for children 10 and younger. Smith contributes to the development of healthy children, strong families, and safe communities by: 1) maintaining a proud tradition of free family admission; 2) partnering with community-based organizations to reach a diverse audience; and 3) advocating for the importance of play. Smith opened to the public in 1899, built with a bequest from Richard and Sarah Smith and dedicated to the memory of their adult son, Stanfield. Smith’s beautiful, 16,000 square foot Playhouse was designed solely as a play space for children by one of Philadelphia’s most prominent late 19th century architects, James H. Windrim. The Playground is situated on its original historic landscape – 6 1/2 acres of open fields, wooded terrain, and sloped hills – and is home to the century old Ann Newman Giant Wooden Slide, a treasured play experience for generations of Philadelphia’s children, as well as other unique pieces of play equipment. Today, Smith welcomes an annual audience of 220,000 from every neighborhood in Philadelphia and many more communities throughout the region and the world. A wide range of community-based programs helps ensure that children living through adversity can enjoy the physical, social, and emotional health benefits of unstructured play. 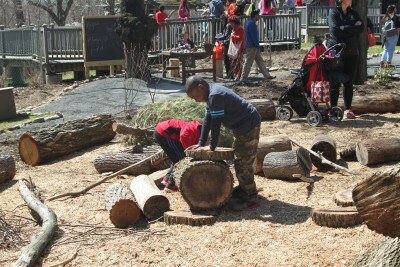 The Nature Explore Space at Smith was generously made possible by the U.S. Forest Service in collaboration with the Arbor Day Foundation and Dimensions Educational Research Foundation, with additional help from the Forest Service Northern Research Station, Delaware Valley Association for the Education of Young Children, Philadelphia Horticultural Society, Philadelphia Water Department, TreePhilly, Octoraro Native Plant Nursery, Edge of the Woods Nursery, and Mid Atlantic Natives Plant Nursery.